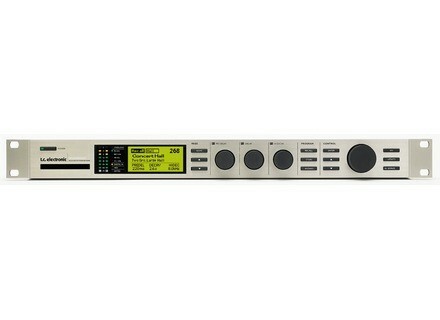 Reverb 4000, Reverb from TC Electronic. demozic's review (This content has been automatically translated from French)" Excellent reverb for upscale work"
The quarter of 6000 with a TC only algo reverb (no compressors, multi-effects and others) and rather use music (no surround, no algo-VSS3 Film). Great build quality, this is the CT (this is serious). Reverb level: the best of the algo reverb TC M5000 from 6000 through the M3000, all in 4 categories Hall, Room and Plate Effects (NB: Effects contains only reverb but non-linear). The controls on the front are great. The machine is very easy to access. 1 / soft TC Icon is standalone and does not work as a plug-in (direct recall by project management + Prog Change). Too bad if we had audio + MIDI via USB and soft VST / AU / RTAS / AAX, plug the USB cable alone would have been enough Anyway, this machine was released in 2003 (from memory) and is no longer "supported" TC since qq time. Strangely I prefer settings "Lexicon" I better control. Also note that the loading time of a prg can take 1-3 seconds. Well here we go a bit in the war against hardware plug-ins. I compared bcp plug-ins that have made incredible progress with the power of current computer (convolution and others). For me, the big difference lies mainly in the response and accuracy at low frequencies (including VSS4) thereby sublimating acoustic sound sources whose quality is already very high. But it also gives it the character described by some as "cold." It all depends on what you search. Only 2 plug-ins compete with this criterion for the moment: IRCAM Verb and Tsar1 (Softube). Except that, eg, the Tsar did a wholesale model rgb (vintage tweak is a simple low-cut that I personally heard and mind filter), where the 4000 has a larger choice bcp algo. IRCAM Verb has its own color and is very interesting but less versatile than the 4000. However plug the advantage of being "clonable" to infinity. While bcp current reverb (plug) can already fill 90% of practices in mix (on sources "common"). 4000 filled the remaining for targeted sources (lead vocals, acoustic guitars) or exceptional acoustic quality sets (orchestras, solo piano, brass ensemble) or to recreate a space both light and air 10% (sound design ). To appreciate this reverb, you have to work on material quality (high end). Less essential that there is a 10aine year, it still offers exceptional services. 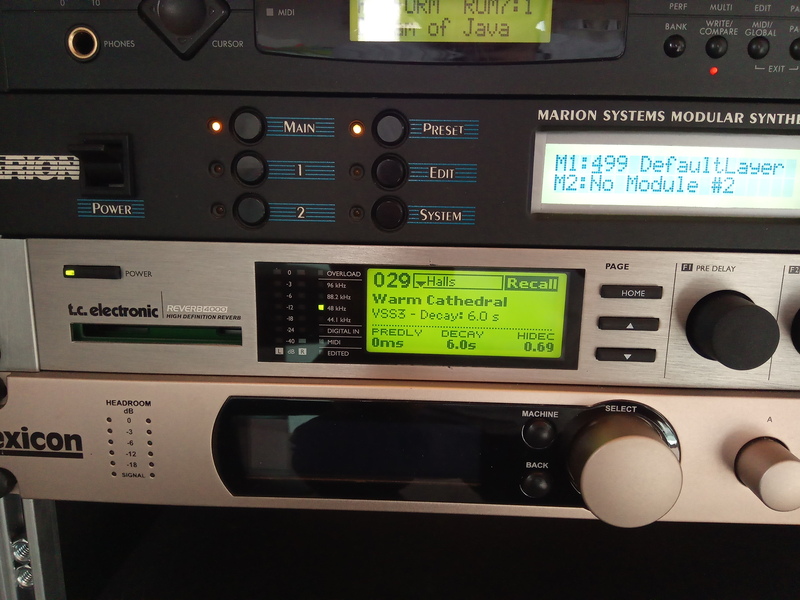 I hesitated with an M3000, and I also like bcp reverb based VSS3. So I'm sure the M3000 can suit bcp users (including Live). Good complement to Lexicon. I regret not buying one (TC4000) or the other (M3000) earlier. blackle's review (This content has been automatically translated from French)"A fresh and invigorating wind blowing in the remote wilds of Scandinavia .."
On the rear panel there are logically everything you need to connect this to R 4000, analog inputs and outputs on XLR symmetrical active. 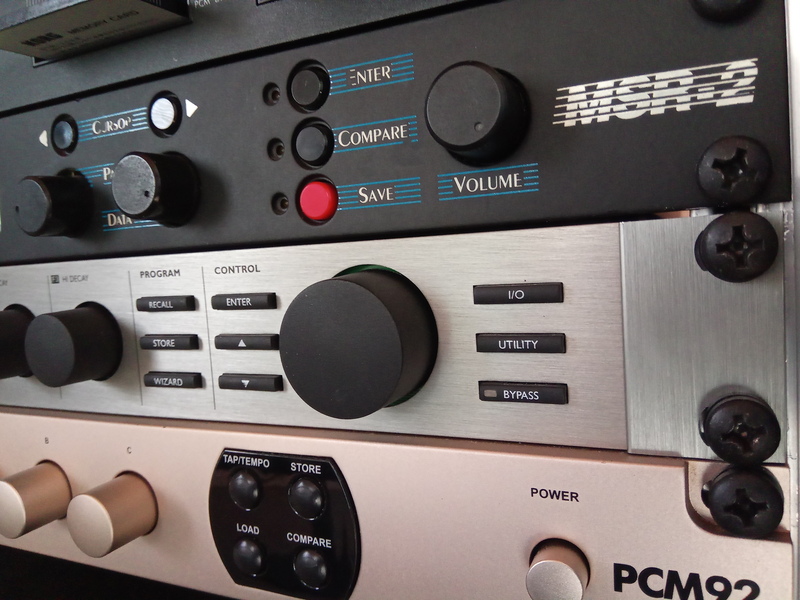 and what is digital, this machine offers a very complete device: Input / output to ADAT Toskink switchable S / PDIF inputs / outputs on XLR AES / EBU and finally inputs / outputs on RCA to S / PDIF. It is very comprehensive and allows to interface smoothly in a particular hardware .. followed by three sheets meet DIN MIDI protocol, and a USB connector for interfacing to a microcomputer ..
To stay on the USB plug, as mentioned above, this makes it possible to connect the R 4000 to a computer, allowing you to edit so perfectly simple and intuitive various programs the bike .. But also and especially to relate this to the beautiful R 4000 Remote Icon Tc found most often on the System 6000 (see Chapter usage). To the front is the classic lcd screen, switches, LED and rotary switches .. Note however that the switches may unlike many M series, leaving room for a large part to three small thumbwheels .. Unlike a previous opinion I find the ergonomics very well thought out, not really necessary to go through the Icon Editor software Tc, although it is actually more convenient. R 4000 can very well stand on its own. And then there&#39;s always the magician "Pschitt Pschitt!" Wizard to ensure easier to use and the choice of certain programs appropriate to a specific application .. In contrast, the use of remote control "Tc Icon" becomes evident once you are absolutely tasted. This remote enables dynamic management of all available parameters thanks to its sensitive motorized faders, leaving far behind the coup tool .. unstoppable! To return to using three small thumbwheels can adjust three parameters immediately and the choice of parameters is performed by two switches present in their counterpart called "Home" which allows it to well, back to all the time the three parameters Tc deemed most important for reverb. Namely, the pre delay, reverberation time and the amortization of higher frequencies .. it is not at all stupid if we considered that it is often the most used settings on a reverberation generator ..
Well, I&#39;m not really dwell on other commands, but be aware that there is also a section or program we find the famous and yet indispensable "Recall", "store" and "Wizard" you make me appreciate all explanations .. and also in the control section including some switches to go deal with some general functions specific to the machine via the menu "Utility". The change presets on them is by the largest of the thumbwheels (called wheel obese) also present in this last section. The screen although small enough to read the various editing pages. The ballistic peak meter is more than enough in common use, and the various lights (LED) indicating the sampling frequency selected, the receiving MIDI signals or active input (digital or analog) and are well placed sufficiently visible. Moreover, the small edition high led practice. And allows a glance to know that you are dealing with a preset published ..
Well, we&#39;re finally in the thick of it. Reverberations long retain clarity for all the sound elements along their falls, without sinking image reverberated in the confusion that almost all entry-level machines or plug in cheap confronted us one day .. for clarity, these reverbs are some programs of stunning realism. As usual the small spaces are the most successful with a special mention for the algorithms from the M 5000 .. However I admit willingly that emulations of old machines such as EMT 250/140 or the AMS RMX 16 I&#39;ve never been packed away as the sounds are original .. Moreover, regarding the emulation of the AMS I wish that Tc Electronic explains how they managed to achieve this .. In short .. That said, it is not specific Tc Electronic .. Very very good reverb unit is the pro and this is seen and heard! Okay, this is not a 6000, it is much simpler. Moreover it would be futile to try something other than reverb presets. Certainly, the followers of "the queu-leu-leu" probably regret resonant filters do you want in here, or dynamic filters, chorus and flanger and tremolo other cousins ​​.. but that is not its purpose .. its mission is to provide high quality reverbs unadorned. And here it is clear that Tc Electronic excels in this area. Okay, it will never associations allows effects such as M 3000. M 3000 but will never get as natural reverb ..
Negraval's review (This content has been automatically translated from French)" It's good stuff"
The effects are mainly reverbs. But there are many types in presets. This is of course digital. Connectivity I / O analog audio and SPDIF. MIDI driver. USB port for control and editing via PC / MAC. I will not dwell longer because the manual is available on the website of tc. I put 10/10 as there is everything you need for the price (€ 1050 new). There are two main possibilities of use: Basic and in depth. Use of the many presets and editing pre-delay, decay and hi-decay on the front. Enough to have a lot of things. Using in-depth, so is the PC or Mac connected is becoming essential, otherwise you get lost in menus and sub-sub menus. The manual is well done. I put there as 10/10 because it is so comprehensive that I have not (yet) all inclusive. This is the reverb tc. Always the eternal comparison tc vs lexicon. Overall it's good (for the price that was suddenly divided by 3, then is back just as suddenly, it's also why I bought it, the normal price is prohibitive). I have the Eventide, Lexicon of (low-end: MX200), the Boss (SX700), and tc. My favorite reverbs are those of the Eventide (eclipse), and then the tc. But there is not a huge difference between the two. The eventide is a little more "mellow" and AC, I prefer (but it is two times more expensive than tc). Purchased in June of this year, I am far from having made the rounds. Quality / price ratio correct (anymore). No problem, at that price I do not regret the purchase. I put a small damper on ergonomics, that of the Eventide is much more intuitive.